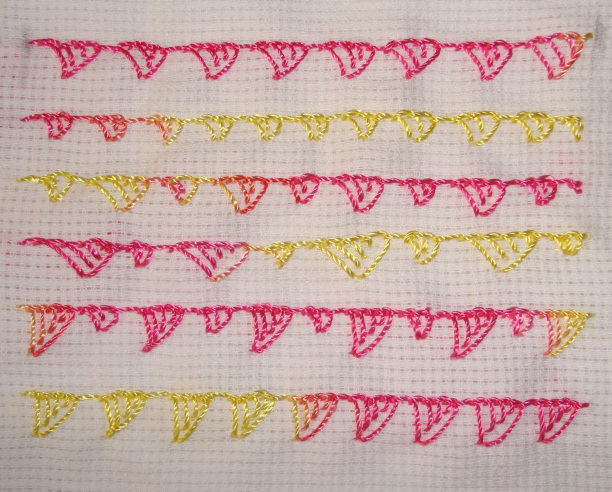 Last week’s stitches on TAST and SSS challenges were completed and the details were posted on the blog. I have to start on this week’s SSS stitch. This week’s TAST stitch was worked earlier. Some of the projects were left in Muscat, while leaving for India. 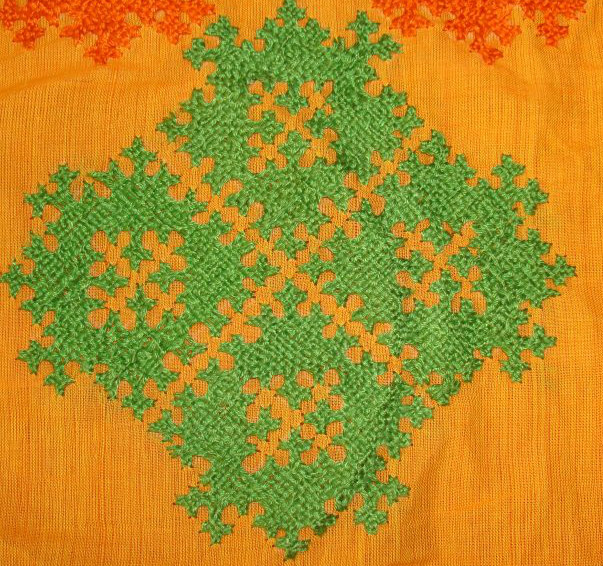 The embroidery was restarted around the neck for this green Benarasi georgette fabric. 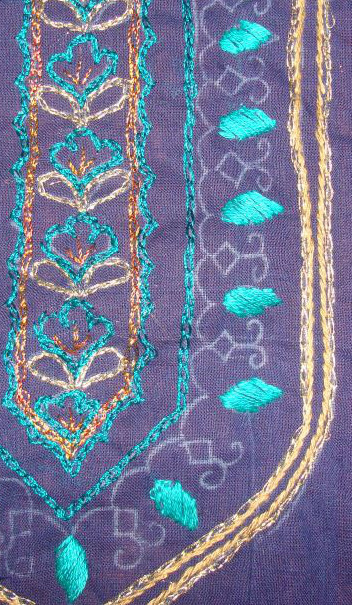 Working with green thread and gold metallic thread was completed before the vacation. I started with gold zardosi beads and small white stones. Another project which needs to be worked is the cross stitch on Aida cloth for blue polyester linen tunic. Presently working on this project, picture is yet to be taken . 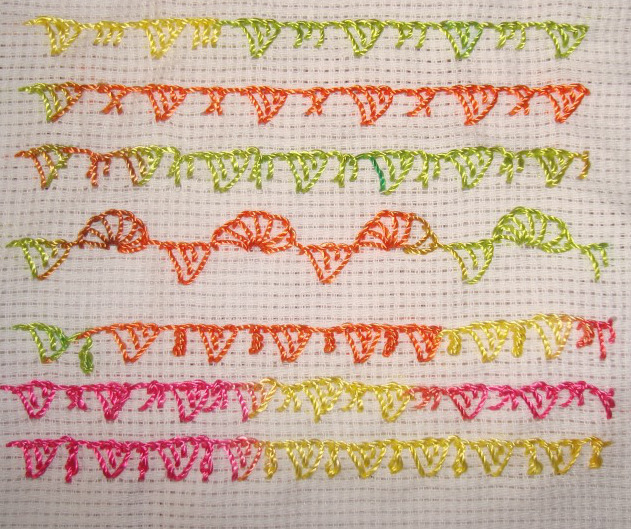 1.In these samples this stitch is combined with other variations of buttonhole stitches. First row- with three buttonhole stitches. 2.Triangular buttonhole stitch is used for couching satin ribbon in the first row. The stitch worked over lace in the last row. 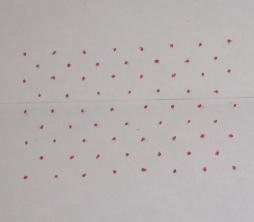 1.These first few rows are variations of this stitch, the variations are in height, width and angles. 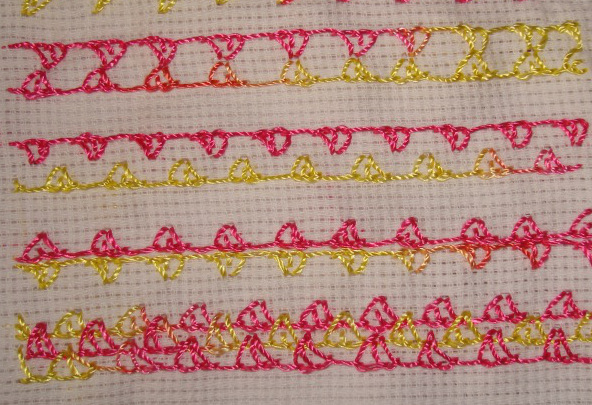 2.two or more rows of this stitch are worked in various ways in these samples. 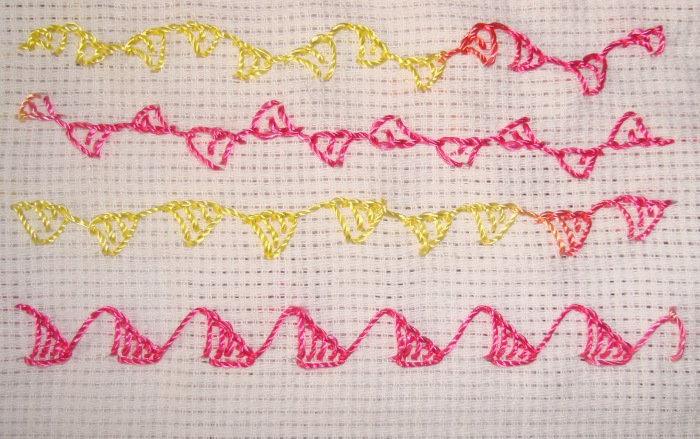 3.The stitch is worked in a curve in the first row. Both sides are worked in the second row. The triangles are worked alternatively in two heights in the third row. The buttonhole stitches are worked at an angle in the fourth row. I like this row. I wanted mix and match two different fabrics on a tunic. 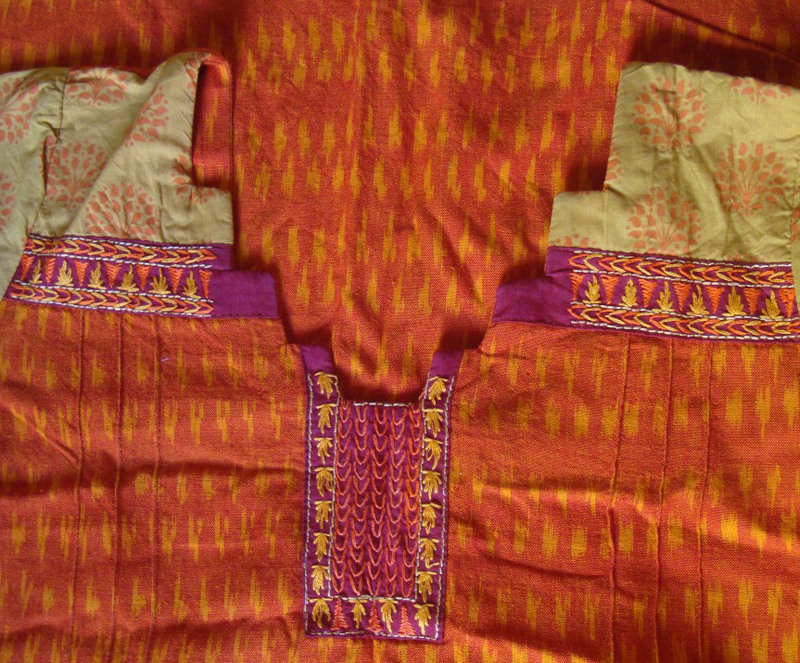 The tunic was orange and yellow woven ikat fabric, to match with this a block printed cotton fabric was chosen. After this step, there was no design idea forthcoming to do what I wanted. 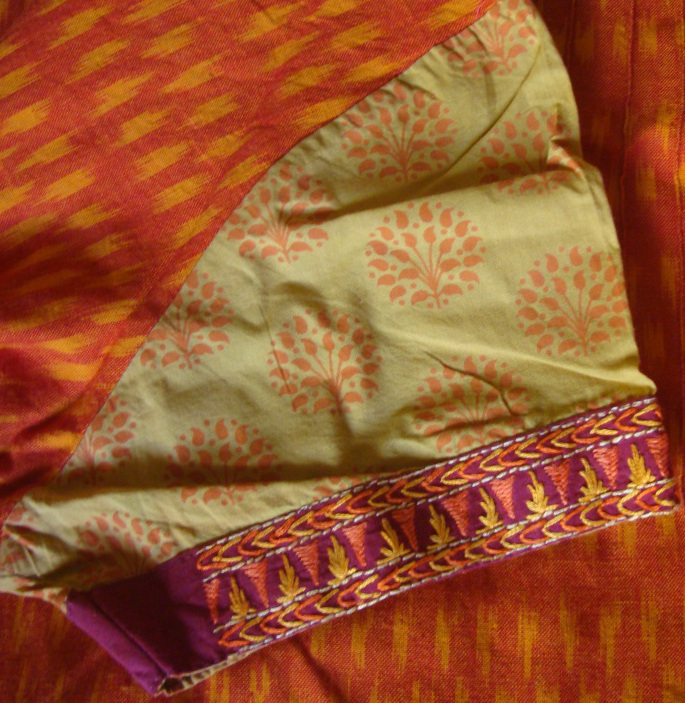 An idea in the form of plain maroon fabric, which could be used for the borders and the salwar [Indian pants] came into mind. Then I drew a very simple geometrical pattern for the borders and yoke on a graph paper and traced them on to the maroon fabric. I did not have look far for the colours for embroidery, they were taken from the two tunic fabrics. A light beige colour thread was added to give contrast. The tailor made a good job of sewing everything together. The sleeve with the embroidered border. The tunic being cotton is very comfortable to wear during summer, which is 9 months in a year! The printed fabric looks dull compared to the ikat. That was the reason why this tunic needed an embroidery on maroon fabric. 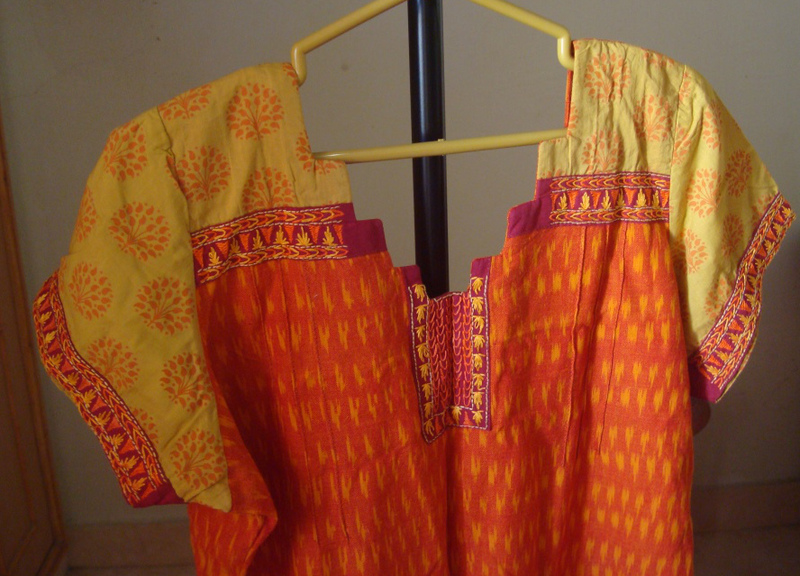 Another way of enhancing this tunic would be to embroider over the block prints. The idea is late for this tunic, maybe I‘ll use this for another fabric.